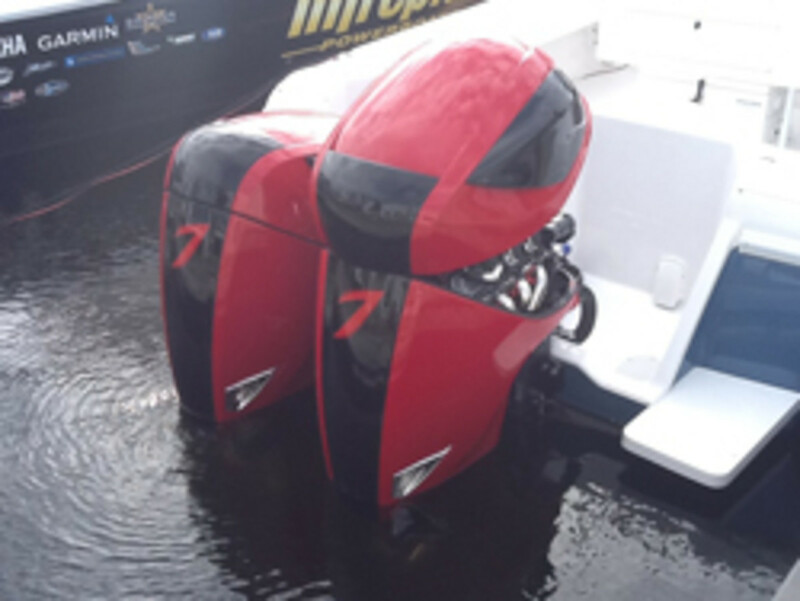 Expect to see Seven Marine prominently displaying its 557-hp 6.2-liter outboard this fall at the Fort Lauderdale International Boat Show, company officials told TradeOnly Today. "It&apos;s an exciting time for us right now because ... we launched production back in December , but it takes a while for the boats to get through and out into the customers’ hands," said Seven Marine vice president Brian Davis, the son of company founder Rick Davis, a former Mercury Marine engine expert and executive. "But that&apos;s happening now, which has been a really neat process for us. It has been really cool to see all the manufacturers start to spool up and make deliveries." Seven Marine has taken a 376-cubic-inch General Motors engine used in the Cadillac CTS-V and turned it into the highest-horsepower production outboard — the Seven Marine 557. The engine weighs 1,000 pounds and has an estimated retail price of $68,900. Seven Marine, based in Germantown, Wis., introduced the 557 at the 2011 Miami International Boat Show, but only now are we seeing the company&apos;s product being pushed into the market. Click play for a look at the 557. “That delay is because some of those first engines were ordered to the United Arab Emirates and we&apos;ve been working our way through those shipments, and the domestic [customers] are getting shipments, as well, now," said Rick Davis, who is also the company president. "That has been more of the delay than anything else — filling the pipeline, beginning with the guys who ordered first." Boats from Yellowfin Yachts, Intrepid Powerboats, Hydra-Sports and Nor-Tech are expected to be on display and rigged with 557s, according to the Davises. Yellowfin will have a 36-footer with twin 557s. Nor-Tech will hang a pair on its 34-foot model. A trio will power the Hydra-Sports 42 center console and two more will be rigged on the Intrepid 375 CC. Intrepid is performing sea trials on its Seven Marine-powered craft. “We have rigged many [375 CCs] with triple V-8 Yamaha 350s with a top speed of around 68 mph, and it looks like with the Seven Marine engines we are getting a little better speed than that and we have dropped an entire motor — pretty cool!” Intrepid Powerboats president Ken Clinton said. 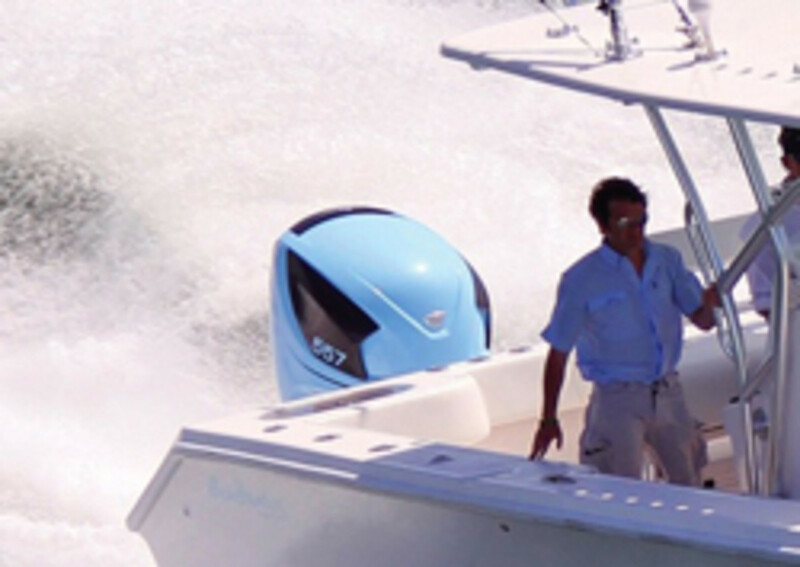 Intrepid rigged a 370 Cuddy with a pair of 557 prototypes for the Miami show in 2011. Seven Marine has sold a "significant amount" of engines abroad and is beginning to sell them domestically, Rick Davis said. One of the challenges Seven Marine has faced since 2011 has been adapting to the growth in the size of center console boats, Davis said.